If you are looking at this page, that means that you have decided to help a child explore and understand a little bit more about how the world around us works. THANK YOU! 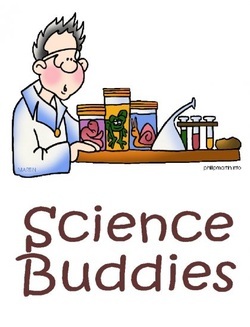 A Science Buddy is an adult (parent, aunt, uncle, grandparent, relative, or family friend) that is willing to act as an assistant to the junior scientist while they complete the activity of the week. Science Buddies help gather necessary materials, help to read instructions, and help make sure that the junior scientist is conducting the experiments safely. They may be a scribe or a photographer to help keep a record of the experiments. The Science Buddy is responsible for the safe experimentation. REMEMBER - Never leave a child unsupervised while experimenting.